The UAE and other GCC states are global leaders in desalination, and have proved the value of the technology in underpinning water security worldwide, said a report released at the International Water Summit (IWS) which opened in Abu Dhabi on January 16. The world uses almost 87 million cu m of desalinated water every day, and the Middle East and North Africa (Mena) region accounts for 44 per cent of that figure, according to the International Desalination Association. In the GCC alone, Saudi Arabia, the UAE, Kuwait and Qatar are all among the world’s 10 largest users of desalination, it stated. Hosted by Masdar as part of Abu Dhabi Sustainability Week, the IWS will be held in strategic partnership with Abu Dhabi Water and Electricity Authority (Adwea) till January 19. Now in its fifth edition, IWS is the Middle East’s leading exhibition and conference for water security, located alongside the World Future Energy Summit (WFES). IWS 2017 will host high-level decision makers from water utilities across the Mena region, creating an essential market for innovations in both water production and water conservation, including infrastructure improvements and wastewater treatment and recycling, said the organisers. The IWS 2017 Market Report, compiled by Frost and Sullivan, found that the UAE uses thermal processes for around 88 per cent of its desalination needs, based on figures from Global Water Intelligence. A review of recent research into water security, has demonstrated significant potential for innovative desalination technology to improve sustainability in the UAE’s water supply. Historically, the region has used thermal processes using waste heat from electricity generation, it stated. Now Masdar is leading efforts to link desalination to renewable energy, investigating the latest advances in technologies such as reverse and forward osmosis, which use a high-tech membrane to filter seawater, and integrating this with solar power generation, said the report. The aim is to find the best, most advanced solution, tailored to the region’s environment, it added. 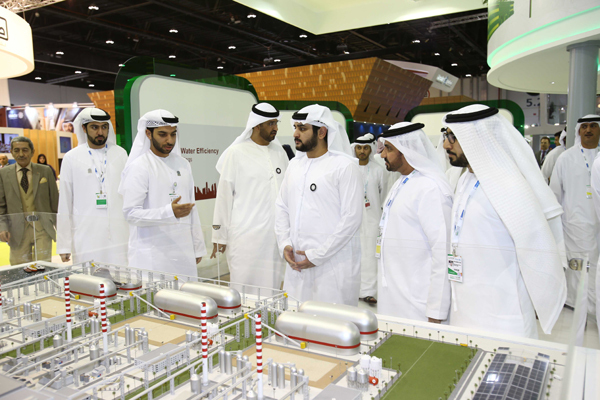 “Innovative desalination technologies have the potential to make a significant contribution to the energy goals of the UAE and Mena region,” remarked Mohamed Al Ramahi, the chief executive of Masdar. "This region has led the way in proving desalination as a viable and secure source of fresh water, and we are now at the forefront of researching new solutions which are both sustainable and commercially viable," he noted. Clean energy desalination will be a key topic on the IWS conference agenda, including discussion of progress from Masdar’s Renewable Energy Desalination Pilot Programme. As part of the pilot programme, Masdar has been operating four small-scale desalination plants since 2015, with each plant testing a different desalination process. Three are based on reverse osmosis, while one uses forward osmosis. With more than a year’s worth of data now to be studied, the results will help identify the most efficient technologies to be coupled with solar energy, offering policy makers and industry a path forward to achieve environmentally sustainable water security. Abdullah Musleh Al Ahbabi, the chairman of Adwea, said: "The region is seeing heavy investment in solar energy, and there will be less use of fossil fuels in future expansion of the electricity supply across the region."